Celebrating our 32nd year of publication • Visit us online at www.worldfencenews.com • SEPTEMBER 2016 For 35 years, residents of Park Ridge, a 122-unit condominium com- plex in Marietta, Georgia, "co-exist- ed" with the wood privacy fence in- stalled on the property, in spite of the constant maintenance costs required to keep it looking nice. Perhaps it was a love-hate relationship, because they liked the appearance of the wood, de- spite its disadvantages. But by last year, the Park Ridge Homeowners Association (HOA) had reached the breaking point. The complex was on its third wood privacy fence since opening in 1980, and the HOA was facing anoth- er round of repairs. The fence looked very weath- er-worn by then, and many of the resi- dents' wooden patio gates, after years of expanding and contracting with the weather, would no longer latch. Then, a fence panel fell, leaving nails exposed and creating a potential safety hazard. The time had come to make a decision – authorize the fence repairs and keep on dealing with the same problems every few years, or in- stall a new fence. After careful deliberation, the HOA decided that putting in a new fence was the best choice for the long term. "We decided to put that Band-Aid approach aside because it would have been pointless," said Marguerite Dun- Lany, Park Ridge HOA board mem- ber. "The fence had become unsafe and the cost of ongoing maintenance was getting too high. It was unfix- able." Though the homeowners pre- ferred the classic look of a wood pri- vacy fence, most agreed that a vinyl fence that emulated this look would be a wiser investment, as it would re- quire significantly less maintenance over time. The HOA hired First Fence of Georgia, of Kennesaw, Georgia, as the contractor and began looking at different fence products. After a visit with the contractor's CertainTeed ® fence sales representa- tive, they chose Bufftech ® Imperial Select Cedar semi-private fence in the Weathered Blend color, which is man- ufactured to closely emulate the look of traditional weathered cedar fence and texture of cedar wood grain. In order to stay within the annual budget, the HOA opted to have new fence installed for only half of the 44 patios, accounting for two build- ings. Board members said they were thrilled with the features of the new fence. "The product is completely inor- ganic, so nothing can go bad, unlike wood," DunLany said. "That was a big selling point to us. If we put our money toward repairing the old fence or putting in a new wood fence, we would have been facing the same problems down the road." First Fence of Georgia began work at Park Ridge in April 2016 with a crew of one foreman and two assis- tants. The crew removed the old wood fence for the first 22 patios and began installing the vinyl fence. 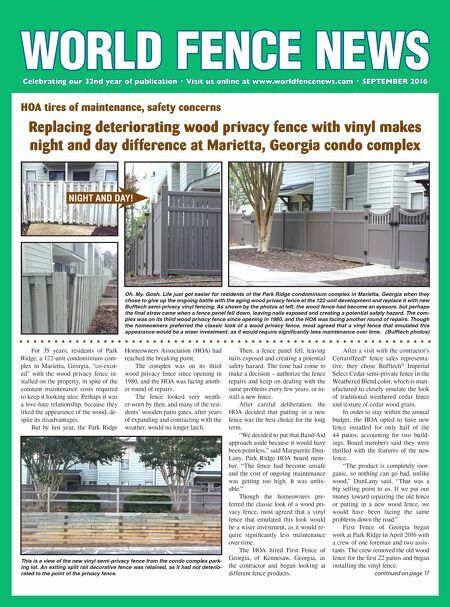 HOA tires of maintenance, safety concerns Replacing deteriorating wood privacy fence with vinyl makes night and day difference at Marietta, Georgia condo complex Oh. My. Gosh. Life just got easier for residents of the Park Ridge condominium complex in Marietta, Georgia when they chose to give up the ongoing battle with the aging wood privacy fence at the 122-unit development and replace it with new Bufftech semi-privacy vinyl fencing. As shown by the photos at left, the wood fence had become an eyesore, but perhaps the final straw came when a fence panel fell down, leaving nails exposed and creating a potential safety hazard. The com- plex was on its third wood privacy fence since opening in 1980, and the HOA was facing another round of repairs. Though the homeowners preferred the classic look of a wood privacy fence, most agreed that a vinyl fence that emulated this appearance would be a wiser investment, as it would require significantly less maintenance over time. (Bufftech photos) This is a view of the new vinyl semi-privacy fence from the condo complex park- ing lot. An exiting split rail decorative fence was retained, as it had not deterio- rated to the point of the privacy fence. continued on page 17 NIGHT AND DAY! 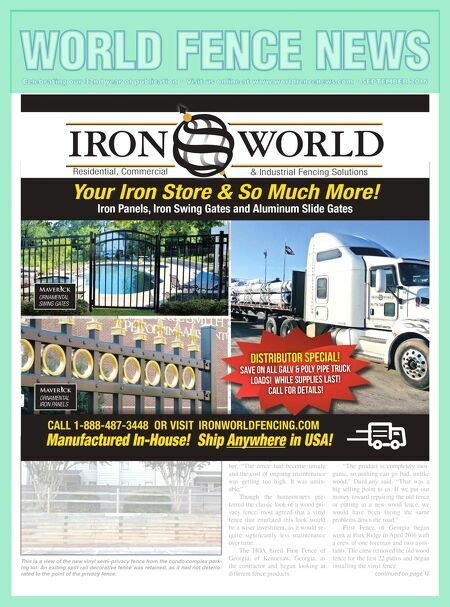 WORLD FENCE NEWS Iron Panels, Iron Swing Gates and Aluminum Slide Gates Your Iron Store & So Much More! Manufactured In-House! Ship Anywhere in USA! ORNAMENTAL SWING GATES CALL 1-888-487-3448 OR VISIT IRONWORLDFENCING.COM ORNAMENTAL IRON PANELS & Industrial Fencing Solutions Residential, Commercial distributor SPECIAL! save on all galv & poly pipe truck loads! While supplies last! Call for details!